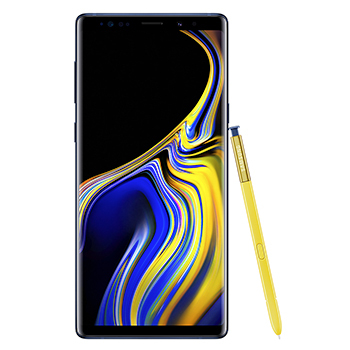 The modern monochrome metal frame available with a matching or contrasting S Pen makes the Samsung Galaxy Note9 is as beautiful as it is innovative. The ida-cut edge offers a high-end, faceted style, while the rear camera blends into the back for an all-around seamlessness. It not only feels good in your hand, it looks good too. The iris scanner and sensors up top are hidden away, cutting down on visual disruptions. Power through the entire day thanks to the 4000mAh battery. Integrated gigabit LTE and Wi-Fi capabilities and a 4x4 MIMO antenna powers extraordinary network speeds up to 1.2Gbps and the 10nm processor and 8GB RAM deliver performance that makes you take notice. Enjoy a minimum of 128GB internal storage, or the 512GB capacity choice, both expandable up to half a terabyte via microSD. Take your photography to the next level with the Galaxy Note 9's dual 12MP camera with 2x optical zoom. The telephoto lens and wide-angle lens work together or create unique portraits with Live focus. Choose between two f-stop modes; F1.5 mode brings in light to brighten up low light shots or F2.4 mode helps make sure your photos come out clear. Capture the perfect group selfie with the Galaxy Note9's 8MP front camera that intelligently detects faces to make sure everyone is in focus. Now with intelligence for extra control, the all new S Pen boasts powerful Bluetooth technology, letting you press a button to take control of your camera, presentations, and apps without touching your phone. While drawing, taking notes, and sending Live messages with the S Pen is as intuitive and natural as pen and paper, thanks to the fine tip and 4096 pressure levels. Immerse yourself in the cinematic experience with a 6.4-inch, virtually bezel-less display, giving you an expansive edge-to-edge surface as boundless as your imagination. Enjoy the uninterrupted view of the Infinity Display's wide Quad HD+ Super AMOLED screen which automatically adjusts the contrast based on the light, meaning you enjoy clear and visible details, whether indoors or in direct sunlight. 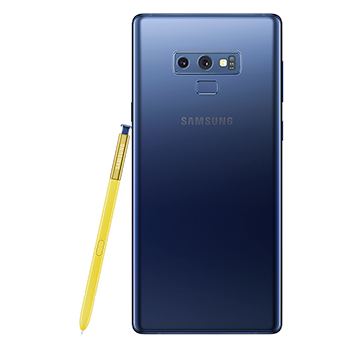 The Note 9 offers 516 Pixels per inch and 2960 x 1440 resolution.